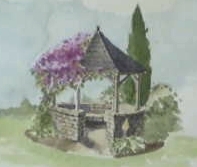 Still in progress, this garden structure has not yet been built. It will feature a stone base with throughstones creating seating. The wooden uprights will be rough hewn timber and the roof will be slate to match the house.